Lots of how to photos on this page. Grafting is done during the winter months when the scion wood is completely dormant. In order to graft your own Japanese maple tree you’ll need a few supplies as well as a Japanese maple seedling that you can use as a root stock. Growing Japanese maple from seed is actually quite easy to do. The ideal size seedling for grafting is usually a seedling that is 3/16″ in diameter. But a little smaller or bigger will also work. In the fall, after your seedlings have gone into dormancy, pot them up and store them outside in a protected area until you are ready to prep them for grafting. Prepping your Japanese maple seedlings for grafting is easy. Just bring the potted seedlings inside where it’s nice and warm and keep them watered as needed until they start to break dormancy. Watch the buds on the seedlings. When you first bring them in they’ll be really small and tight. After being inside at about 70 degrees F. for 10 to 14 days the seedlings will start coming out of dormancy. The buds will start to swell, then open, and soon you’ll see signs of little tiny leaves. The ideal time to graft them is right before they start to produce new leaves. That’s the only preparation that your seedlings need. Don’t fertilize them or anything like that, just bring them inside and let them warm up for 10 to 14 days. The other supplies that you’ll need are a really sharp knife, some grafting wax and some rubber bands that are made for grafting. Grafting rubber bands are pretty much degradable so after being in the sun for several months they start to break down and fall of the plant. That’s important. You should remove the rubber bands manually about four months after you make the graft, but in case you forget it’s better to have grafting bands that are likely to fall off on their own. If you do Google search for “grafting kit” you should be able to find a kit that comes with a grafting knife, a bar of grafting wax and a nice supply of grafting rubber bands. The knife that you use for grafting needs to be really sharp because a dull knife will make cuts with ragged edges and those ragged edges will cause your graft to fail. Scion. What’s a scion? Scion is the term used to describe the cutting that you remove from the parent plant. A scion should only be taken from the end or tip of the branch because the scion you use should be from the current seasons growth. You don’t want to use any wood that is older than one season when you are grafting. The goal when making a graft is to match up cambium layer to cambium layer. The cambium layer is the light green colored tissue right below the bark. The cambium layer is the life support system of the plant. It would do no good to make a graft into the wood of a plant. Your graft must be made in such a way that you are putting cambium tissue against cambium tissue. In the above photo you can see that I am exposing the cambium tissue. You can also see that I have wrapped my thumb with several layers of heavy duty tape. Make sure you wrap your thumb and or any finger that could be in the way as you make your grafting cuts. Remember, the knife that you use is really, really sharp. Protect your thumb and or fingers by wrapping them with tape. Trimming the Scion for grafting. To prepare the scion for the graft you have to cut the end of the scion to a taper so it fits snugly into or against the rootstock. Scion Wood Prepared for Grafting. In this photo you can see how I have made the cut on the scion wood to prepare if for grafting. The very center is wood inside the center of the plant. If you look closely you can see the cambium tissue between the bark and the wood of the tree. A scion ready to be inserted into the graft union. This is called a Veneer Graft because you are actually grafting the scion to the side of the plant and not inserting it into the center of the plant like you would with a saddle graft or a reverse saddle graft. I like doing veneer grafts because this process allows you to match up a lot more cambium tissue than you do with other types of grafts. Notice how snug the scion fits into the graft union. Air space is your enemy when grafting. You want tissue against tissue with no air space. Once the scion is inserted into the graft union you have to hold it firmly in place, then start wrapping the graft with grafting rubber band. This wrap must be tight because you are trying to apply enough pressure to firmly press the two cambium layers together. Just wrap the band around and around, then terminate the wrap by making a little slip knot with the end of the rubber band. 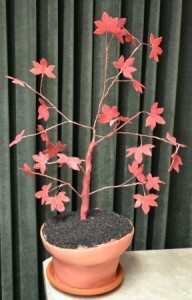 A completed Japanese Maple Graft. Almost done! The only thing left to do is apply the grafting wax. See my little slip knot? Isn’t that cute? Applying grafting wax to a Japanese maple graft. The finishing touch is to coat the entire graft union with melted grafting wax. When melting the wax you have to be careful to not get it too hot. You want it just hot enough so it melts so as you apply it, it sets up quickly and doesn’t run down the stem. If the wax is too hot it can do harm to the plant tissue. Be sure to cover the graft union completely so no air can get into the graft union. Air causes the tissue to get hard and brittle and the two pieces of tissue will not bond. The little brush that I am using to apply the wax is called a flux brush. You can pick one up that the hardware store. A flux brush is normally used for apply flux to copper pipes before you solder them. I think I paid 29 cents for the one that I bought. I found this little candle warmer and glass dish at Walmart. I think I paid about $8.00 for both of them. This set up worked great. I just cut off a chunk of the grafting wax, stood it up in the little dish, and turned on the heat. It probably took about two hours for the wax to melt all the way down so I could work with it, so make sure you get the wax melted before you start grafting. Mike,, when taking hardwood cuttings in winter,do you still need to maintain high moisture or is the cool moisture surroundings enough? Floyd, if you are grafting with these cuttings (scions) then after the graft is complete you have to keep the grafted plant warm and a seal the graft union to keep it moist. A hardwood cutting of a flowering shrub, just stick them in a growing medium outside in the winter and just water when it’s dry. That’s enough. What Japanese Maples do you use for your root stock? Thanks for making your new Japanese Maple grafting video. Most Japanese maples are of the Acer palmatum family so you can use either green seedlings which are acer palmatum or red seedlings which are Acer palmatum atropurpurem. So if you grow your own seedlings, details in the video, just collect some seeds and sow them. If collected from a tree with good red color some will be red, some will be green, all can be used as rootstock. How wide should the root stock be? Only one graft to each tree? Japanese maple root stocks should be at least 3/16 of an inch before you graft to them. As a member of the the Backyard Grower, I find all the information you present so be so interesting and fascinating. I have been doing alot of reading and it is such an upper. THANKS FOR ALL YOU DO!!! Thanks Barbara, I appreciate that. Hi Mike, how old do the seedlings have to be before you can use them as rootstock? That depends on where you live. In north Japanese maple seedlings tend to grow slowly and are still small after one season. Those who grow them in Oregon get a nice seedling in one season. So the true answer is they need to 3/16″ in diameter before you can graft to them. Thanks for your reply mike. I live in Northern Ireland. I bought your DVD on grafting maples about a week ago and I’m just waiting for it to arrive, cant wait!! After grafting a Japanese maple do you cut off the top of the rootstock above the graft. You do, but you can wait until the graft is successful and has leafed out. Then you can remove the top part of the rootstock. I have plenty of a palmatum seedling/saplings for grafting purposes, but I want to graft some extremely slow growing dwarf weeping ornamental Japanese maples. I note in your commentary that you want 3-4 buds off of last year’s new growth for grafting purposes. This particular tree I want to graft throws out only 1-2, MAYBE 3 buds of next growth per year per branch. Will that be sufficient to graft correctly? Thanks, I’m excited to give this a try next year! Try with what you can get. You can also try 2 year old wood, quite often that works okay too. What do you do post-op? Does the grafted tree have to be kept inside and warm until after the last frost before they are moved outside? What’s the procedure after the graft is complete? Do the newly grafted trees have to be kept inside and warm until after the last frost? I know nothing about grafting. I had to trim back my Japanese maple. Is there anyway I can use the cuttings to grow a tree? Like putting it into a solution of some sort? I’ll look for the seedlings, but only have one jap/maple. Wouldn’t that seed be sterile? I know of several Japanese Maples growing in my area. Can I simply collect some of the seeds? 1. what time of year is best to collect the seeds? 2. then what do I do with the seeds? Do I plant them a couple to a pot? Or do I put a bunch spaced out in a flat? 3. once the seeds are in a pot or flat do I leave them outside? Put them in an unheated area? What? I have a Japanese Maple that lost two limbs during a winter with a lot of snow. Can I take a limb from the other side and move it over to the bare side? No, that would be very difficult to make work. Just keep the tree trimmed and it will eventually fill in. Inf you can’t find a grafting knife, a single edge razor blade will do fine. when it gets dull, its easy to swap out for a new one. Most people don’t have a sharpening set up to keep a grafting knife sharp enough for success. I finish sharpening my tools with a 3000/5000 grit combination stone. You can find them at specialty woodworking stores. I got mine because I do bonsai, clean cuts are important. Couldn’t agree more Zack, I think I once had a 1,200 grit stone. Do they make them that fine? It was a while ago. It’s far less expensive than purchasing stones. I do both gardening and woodworking and sharpen most of my tools with paper on glass. A 10 foot roll of 2000 grit paper is about $10. Compare that to about $60 for a 2000 grit diamond stone.. No comparison when it’s all said and done. Thanks for the great money saving tip! Need help. Interested to know what to do (if anything), when I grafting tape looks like it is beginning to split? With two of my JMs, the areas where cuts were made and scion inserted, is turning black. One w/ splitting tape and the other, tape still in tact. Thanks Mike. It’s difficult to say. The biggest thing is make sure the graft unions are getting direct air. That’s why I wax my graft unions. The dry air can dry out the tissue and cause it to not mend together. If you are concerned in a few weeks you can always graft them again with fresh cuts. where can i get scions? From time to time, January and February some of our members, http://backyardgrowers.com/join, offer scions for grafting. Other than that they also offer lots of unique variety Japanese maples for prices that range from $12.00 to $20.00 for really rare varieties. You can for sure get scions off of those next winter. Other than that you have to find trees that you know the name of and you can collect scions from. Do I have to join backyard growers to be able to purchase the lots of Japanese maples? THANK YOU SO MUCH FOR THE INFORMATION, I AM UN ABLE TO DO THIS NOW BUT I CAN TELL FAMILY HOW, I APPRECIATE ALL THE INFORMATION I RECEIVE FROM YOU, I LIVE IN S PART OF OHIO, I AM 88 YRS OLD AND WOULD LOVE TO BE ABLE AGAIN, THANK YOU HELEN BARCUS. Mike, what a clear explanation of this grafting method. Do you think it would be possible to use a veneer graft to promote growth of a new limb or limbs along the bare side of my pink Dogwood tree? It’s worth a try, they do it with apple trees. I bought a Red Dragon JM a couple weeks ago and it has a little tree growing out of the bottom of the trunk. The little tree has green leaves and red bark. I would like to separate it without killing the little one. Is that possible? Can I cut it off the trunk and use root grow on it? Thanks for your help. Probably not. What you see is a sucker, probably from the root stock. It should be removed, but it won’t root. They are difficult if not impossible to root. Thanks so much for responding. I have heard it said before that it probably won’t root but I am going to try. Hi Mike I’m trying to learn to graft my fruit trees, early this year around end of February early March I made about two dozen grafts but not one took, I took care in matching the cuts precisely, wrapping the tape firmly, and sealing the graft to keep precipitation out of the graft and to prevent drying at the point of the graft. In doing research prior to doing the grafts I came across information that stated trees of one type of stone fruit could be grafted to other types of stock if they also were stone fruit, for example peach to cherry, peach to plum which I did, I also have a Japanese plum which is slowly dying which I took tip cuttings from last years new growth and grafted it to the suckers that were coming up from the root stock of that same tree and those also failed. After viewing numerous videos on grafting I feel confident the mechanics of the joining process I did was better than some of the videos I viewed and is not the reason for the failure of the grafts, my question follows. In your commentary on grafting the Japanese maples the scion wood was taken when completely dormant the potted plants were brought into the warm until they broke dormancy, the graft was performed and the potted plant was kept in a warm environment while the graft bonded. I took the scions from the parent plant which was outdoors and grafted to what would be the rootstock which also was outdoors. Should I have taken the scions while dormant and kept them in a ziplock bag with damp sawdust under refrigeration to keep them dormant and made the grafts just after the buds broke on the rootstock later in the spring and just starting to push leaves when the temperatures are warmer? Are warmer temperatures necessary for the graft to heal? I live in central Wisconsin my neighbor had cut down a dying hard maple at the time I did the grafts and even though it was February very early March we had a period of warmer weather and the sap was flowing on that hard maple long before buds would break and leaves would show. I thought this would be a good time for the grafts to take being nutrients and moisture would be plentiful but not according to my results. If the grafting doesn’t work out I also would like to know if its possible to start a new tree from the Japanese plum I’m losing by taking a hardwood cutting similar to hardwood grapevine cuttings, I would need to know if there is a specific time of year to take the cuttings, how to cut or prepare the cutting, time frame for rooting to take place and also care of the cutting after its stuck or if the procedure is pretty much the same as hardwood grape cuttings in taking the cutting and care of. Can I graft Japanese maple to just a red or silver maple. I ask this because I have a few hundred of them and I’m wanting to get some lace leaf Japanese maples going. No, they are not compatible, it has to be acer palmatum. Can I graft multiple types of maple onto an already small but established tree? You probably can, not sure what you’ll end up with. How old does the parent Japanese maple plant need to be before it can be used for scions? Thanks. Looking forward to trying grafting. Just old enough to yield good scion wood. Scions from young healthy trees is probably better than older trees. But they all seem to work just fine. Thanks for the info. I graft fruit trees and i want to do japanese maples too. Would putting the plants in a warm greenhouse be beneficial to callusing and cambial knitting? I have ‘buddy tape’ which is a wax tape that falls off but are the rubber bands better for maples? Can you graft other times of year? The market for fruit trees is huge just as it is for Japanese maples. I think the person that buds fruit trees, grows them out to about 18″ so they will easily ship through the mail could sell thousands of them. The greenhouse at about 70 degrees would be perfect for bringing the root stock out of dormancy, then also to get the grafts to heel would also be perfect. Buddy tape? I’m not sure how well it would work on a Japanese maple graft. Some do some grafting or chip budding of Japanese maples and other things. Budding can be done in the field in July and August. I have no idea, but I’d love to know if it works for you. Please let me know. Give it many months. I am getting confused with various information out there. Do I have to use another rootstock that is a JM? Can I use the rootstock of a larger species…such as Red Maple?p or a Sugar Maple? What about using the healthy rootstock of a completely different species of tree to graft JM…like a cherry or oak? It has to be Japanese maple root stock. Either Acer palmatum or Acer palmatum atropurepurum. Nothing else is going to work. I want to get started in growing and grafting Japanese maples. I have watched a lot of your YouTube videos and they are very informative. Just moved from Ohio to Georgia and learning how to garden down here still. Things are a little different down here, but love the longer growing season. 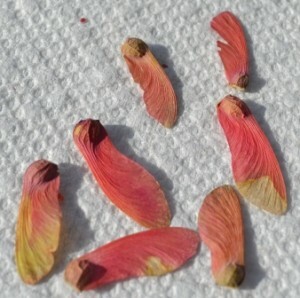 If I have to wait until Winter to graft Japanese Maples, where do I find fresh, young actions in January or February? Can you graft Japanese Maples onto Sugar Maple root stock? No, it would never work, it would have to be another Japanese maple grown from seed. Any other maple would grow way too fast and the scion could never keep up, even if they were to bond. Mike, when you say to bring the root stock indoors do you mean in a greenhouse, or will my home in front of a bright window work okay? And if you’re doing this in the middle of winter and only need to keep the tree warm for 4 weeks or so where do I put it then, if it is still freezing outside? Inside your house with some natural light will work fine, but once you bring them out of dormancy they have to stay inside until the danger of frost is past. I’m extremely new to gardening and planting outside. I purchased a red/burgundy Japanese Maple last year. Since then, it has grown fast and beyond my expectations, but all of the new growth is green leaves. I want to keep the red/burgundy leaves on it and I’m hoping that the green will change. I’ve searched other sites that suggest that I pick all of the green leaves off of the tree and in doing so, it will allow the red leaves to bloom. Is this normal? No, it is not normal. If your tree currently as both green and red leaves you need remove the branches that are producing green leaves. Remove them completely, do not leave a short stub, they really have to be removed completely.